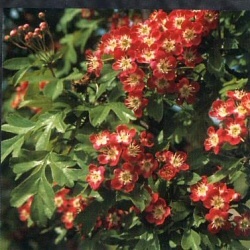 Rather different to our other hawthorns, the Red Hawthorn Crimson Cloud (Crataegus laevigata 'Crimson Cloud') is noted for its dramatic display of single, multi-coloured flowers. The attractive flowers are dark reddish colour around the edges with cream centres, these flowers appearing in late spring. It is further complimented by its attractive shiny, green leaves. Like other hawthorns, this variety is well-suited to most garden positions and with a height of just 5m (16ft) and spread of 5m (16ft makes this ideal for covering a large wide gap in an existing garden. This tree is easily trimmed and a few of these planted together will make an attractive hedge. Our Red Hawthorn Crimson Cloud are supplied at a height of between 1.5 and 2.4 metres in a 12 litre container, which means that the tree can be planted any time of the year and with better results than either bare-root or rootballed trees. We usually have a couple of size options available, if you do not see the one you like that will be because it either does not exist (we do have some unreasonable expectations from customers!) or we have sold out. Our Crimson Cloud are "usually" sold as a half standard which means there is a nice section of clear trunk making it look quite ornamental. If this is absolutely important to you to have or not have then it is absolutely important you contact us before purchase to check. This is mostly because we are not mind readers, participate in any customer telepathy scheme or have the ability to anticipate your wishes. We tried teaching ourselves this a few years ago by intently looking at the screen and concentrating as hard as possible but we got closer to compounded constipation than predictive anticipation.